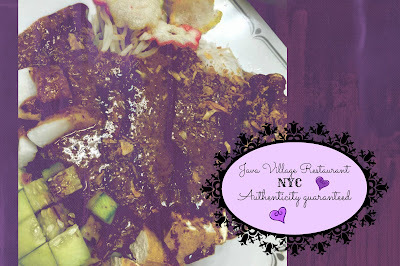 Looking for yummy Indonesian food here in New York? Almost all the time :-). An I have one favorite spot to satisfy my craving for Indonesian food. If you miss nasi gudeg, ketoprak, mie ayam, nasi goreng, pempek and bubur ayam while you are in New York City, come to Java Village. Sudah bukan rahasia kalau kuliner Indonesia memang tiada dua. Di mana pun berada :). dan safe haven saya di New York City untuk urusan kuliner Indonesia adalah Restoran Java Village. This is the place where you have the real Indonesian food! Enjoy its chicken porridge, Indonesian fried rice, Indonesian salad with peanut sauce or gado-gado, ketoprak or Indonesian dish with rice noddles, fried tofu, steamed beansprout and peanut dressing. Not to mention nasi gudeg, a traditional mixture of sweet young jackfruit stew, egg and chicken, or nasi empal, marinated fried beef and also nasi uduk. Don't miss its ready to eat food as well..
With choices of meat and vegetables like kale in coconut milk, chicken and fish curry, and many more. They also have some ready-to-eat cookies, cakes and dishes for you to take home :). More Indonesian food for everyone. A lot choose from and everything is tasty. And another important thing here is that everything is halal ;). Perfect for us who are craving for homey food and halal as well. The restaurant is small but clean and decent. Best to have the food for take away :). So, Indonesian food lovers, come and grab your favorite plate here. I will have to check it out the next time I am down there. I have never had Indonesian food before. I think that's the cool thing about NY. You can pretty much find any restaurant to satisfy your food cravings! Glad you found some authentic Indonesian cuisine!